Working out during your lunch break is not only a great way to keep fit and healthy, but it also boosts feelgood chemicals in your brain which can help keep you focused and energised. Essentially, when you duck out for a workout at lunchtime, you can avoid the dreaded 3pm slump and working out at lunch also ensures that you fit exercise into your day. After all, we all know that in the mornings it’s easy to simply hit snooze and promise yourself that you’ll go tomorrow; and for most people, the couch, a movie and some food sound much better than a run around the block after a long day at work. So if you’re keen to try out a lunchtime workout, read on for tips, tricks and a cardio pumping, strength training program that you can do anywhere. The night before, pack a bag with your workout clothes, towel, face wipes, deodorant and whatever else you will need for your workout. Leave this bag at your front door, or near your wallet and keys so that you don’t forget it in the morning. Night is also a great time to pack a healthy lunch that you can eat at your desk after you have worked out. Try a Tupperware container with leafy salad and a portion of protein, it’s quick, tasty and healthy. 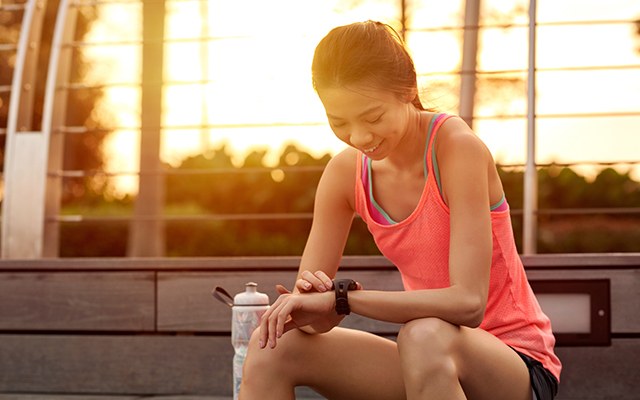 Set your phone alarm for 10 minutes before your lunch break to remind yourself that you need to head out for your workout. Briskly walk to wherever you have planned to work out (this walk can serve as part of your warm-up). Interval training is going to give you the best results in a short period of time. So your warm-up will be done in an interval style. Rest for 20 seconds then repeat the set 3 times. Here’s where we’re going to get your heart rate up, burn calories and build your strength. After you finish the circuit, rest for two minutes, then repeat it. If there are exercises listed that you have never encountered before, or would like to learn more about, click on the exercise name for a video demonstration. Stretching for 5 minutes will help your muscles recover, meaning that you are not as sore the next day. Hold each stretch for 30 seconds for maximum benefit. If you don’t have time to shower before you need to get back to work, face wipes, dry shampoo and deodorant can work wonders in a very short period of time. When you get back to work, make sure you have a big glass of water and eat your lunch. Open Colleges offers a number of personal training and fitness courses designed to give you the knowledge and skills to make fitness your career. If you’re looking for some lower impact exercise, you could try yoga. People of all ages and abilities see lots of positive results from regularly practising yoga. Our article on 7 reasons to love yoga is a good place to start if you want to find out more.